I got my first boat before I got my first car. I started fishing off Victoria at the age of 15. Soon I was catching enough fish that my Dad’s buddies were asking to come out fishing with me. That is how it all started. At 17, I went commercial fishing on a salmon troller. We fished all around Vancouver Island and halfway to the Queen Charlottes. I started my professional guiding career in the Queen Charlottes as fish master for an exclusive lodge. I guided in the Queen Charlottes for five years until in 2000 I started Ocean Rambler Fishing Adventures with a 25ft Bertram. I started out fishing Victoria and Port Renfrew but soon realized Port Renfrew was lacking the amenities the clients were looking for. I moved my operation further West to Barkley Sound and Ucluelet which is a beautiful little fishing village. Fourteen years later, I have upgraded to a luxury sport fishing vessel with my 28ft Bertram. This is the ultimate in luxury sport fishing. My mission is fishing but your enjoyment and safety is my number on concern. I am fully insured and licensed by Transport Canada. No one can guarantee the weather but what I can do is take you to a comfortable place to fish if the weather is inclement. Calm waters are always available in Barkley Sound. Inshore fishing is always available in the protected waters of Barkley Sound. Barkley Sound has many beautiful islands and scenery with whales, bears, deer and eagles are common viewing in a day of fishing. I recommend families with small kids and people who are unsure of open water fishing, fish the beautiful inshore waters of Barkley Sound. A full on adventure fishing trip awaits with a short five mile run to Amphrite Bank or a twenty mile run to La Parouse Bank (also known as the Big Bank). 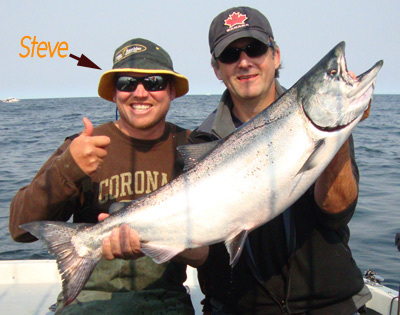 These are some of the most favourable fishing spots to catch up to fifty salmon a day. All five species of salmon travel the fertile waters of Ucluelet. When the mighty Pacific Ocean pushes abundant schools of feed up onto the banks it creates a feeding frenzy like no other. It is very common to limit out on salmon and halibut every day you take an offshore adventure fishing charter. The fish are bled immediately and stored on salt ice for the duration of your trip. I am happy to filet your catch upon arrival back at the dock. If you wish to have your catch vacuum packed and ready for transport, I can arrange for your fish to be vacuum packed and frozen in two locations across the street from dock.